For more than 10 years, the culture of Bali has magnetized foreigners to visit this island. Their unique religion ceremony becomes lures renowned all over the world. 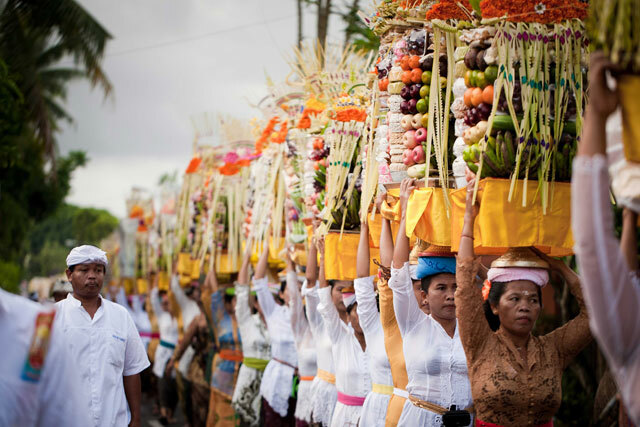 This 10 February, Balinese Hindu people laud the one of the big celebrations over the year, Galungan. Galungan is celebrated as the winning of virtue over villain. It marks the descent of Gods and ancestral spirits upon the earth. The celebration will begin on 9 February 2016 when the locals gather and feast on suckling pig or other traditional food. While the women cook for the dining, the men create penjor, a bamboo pole with offerings on the tip of it, to decorate every house. On the Galungan day, they nourish their relationship with the big family by visiting their houses bringing crops. After 10 days staying in the earth, the Gods and spirits will ascend back to the heaven. The day is honored as Kuningan. Samabe Bali Suites & Villas is a 5-star world-class beachfront resort uniquely situated on top of the cliffs of southern Nusa Dua, boasting magnificent, uninterrupted views of the Indian Ocean. It offers a whole new all inclusive concept of luxury called "Unlimited Privileges." The benefits include a full gamut of premium meals and beverages, 24-hour butler service, a wide selection of signature activities, entertainment, spa treatments; return airport transfers, and more.